Lion Engineering Services has always been at the forefront of providing equipment to the ultra-competitive oil and gas industry. Yet when an unreliable supply chain threatened to impact delivery schedules, it turned to Yamazaki Mazak and hasn't looked back since. Based in Great Yarmouth, Lion Engineering cut its teeth in the early stages of the North Sea drilling industry by offering precise machining and welding services to those involved with offshore and onshore drilling and exploration. Over the last four decades, the company has worked with some of the biggest names in the oil and gas sector, not just in the North Sea, but all over the world, manufacturing a wide range of products including offshore and onshore directional drilling tools, stabilisers and crossovers. Martin Brown, Lion Engineering Services' managing director, is all too familiar with the challenges of working in such a demanding industry: "Up until a few years ago, it was easier for us to outsource most of our large CNC machine work because our on-site capacity was limited and we only had space for some smaller CNC and manual machines," he says. "However, we were increasingly finding that many of our contractors were operating at full capacity and were unable to meet our deadlines." "To avoid a knock-on effect further up the supply chain and rather than risk losing business and disappointing customers, we decided to expand our own machining capabilities in Great Yarmouth. I visited several companies but I was particularly impressed by Yamazaki Mazak's European Technology Centre in Worcester. 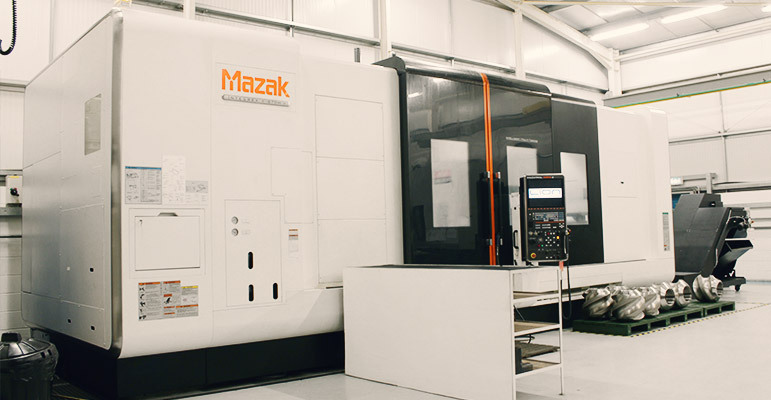 The equipment it was able to showcase and the level of application support on offer to machining companies like Lion Engineering, was certainly a key factor in our decision to work with Mazak." Lion Engineering began its relationship with Mazak in 2008 by purchasing a QUICK TURN NEXUS 350- MY2 CNC lathe and a Vertical Machining Centre VTC 300C-II, replacing some of its outdated manual and CNC machines in the process, which were no longer suitable for the ever-increasing production machining demands of its customers. In response to the rise in demand for its services over the past four years, Lion Engineering has spent over E3 million on facilities, including £1.8 million on expanding its Mazak machining range alone. The company's machining capabilities now includes a VTC 800130 SR vertical machining centre; a QUICK TURN NEXUS 450-11 lathe; an INTEGREX e-500H II and an INTEGREX e-670H II. To accommodate its machining technology purchases, Lion Engineering has also increased the size of its Great Yarmouth factory site by an additional 8,000 sqft of floor space, including a 4000 sqft expansion in 2012. "It's vital that we invest in highly advanced and efficient technology," continues Martin. "Given that we regularly work with some of the most important names within the oil and gas industry. Many of our machines need to be capable of housing the sheer size of the drilling tools we have to manufacture and also ensure that all of our parts are machined to the very precise requirements of our clients, in the quickest time possible." "Our most recent purchase is an INTEGREX e-670H II, from July 2012. We initially opted for an INTEGREX e-500H If with a 1500mm bed in 2011, which is a brilliant production tool. However, we're regularly required to machine large parts, such as down-hole drilling tools, and decided to also go for the INTEGREX e-6701-I ll with its 3000mm bed, as it offers us a much greater capacity in both swing and length." The INTEGREX range embodies Mazak's 'Done-In-One' machining philosophy, where the raw material is transformed into a finished product by just one machine. This ultimately results in significant savings in terms of both time and costs. "The high value 5-axis simultaneously controlled system on both INTEGREX machines negates the need for multiple lathes and mills," says Martin. "This, together with the highly efficient MAZATROL control system; high pressure coolant and large horse power drive - which reduces vibration and increases tool life - makes a significant contribution in reducing machining time and tooling costs." "Compared to conventional CNC machines, we estimate our INTEGREX machines achieve savings of between 25-30% in production times, thereby increasing the company's overall machining capacity. As a result we can offer our customers a variety of machining options, from one off prototypes to larger batch orders, in a range of different materials." Lion Engineering's six Mazak machines make up over 50% of its total machining technology and Martin is already looking ahead: "With regard to the future, we're now looking at investing in another INTEGREX machine for some of the more complicated, smaller components that we are beginning to manufacture. Discussions with Mazak are also in the pipeline regarding the acquisition of an INTERGREX J series model as well. In this industry you need be constantly improving and our Mazak machines have led us to the forefront of our industry. We've got no intention of stopping here and I'm sure our fruitful relationship with Mazak will continue to grow."